The MercedesTrophy is a unique series of premium tournaments for amateurs, in which over 60,000 players from more than 60 countries took part in 2013. 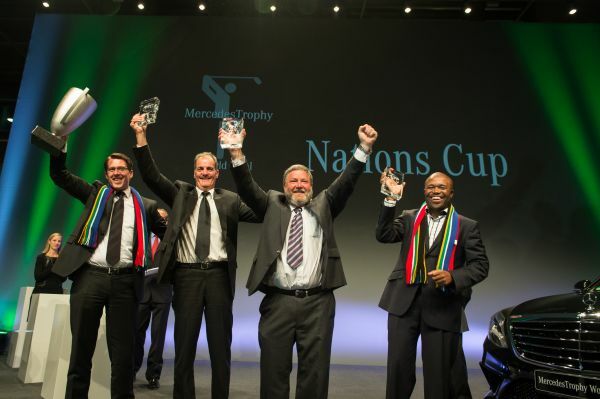 33 Teams from all over the world, each made up of three players, contested the 24th MercedesTrophy World Final. Team South Africa won the Nations Cup with a total of 189 points. Second place went to the team from United Kingdom with also 189 points, defeated by South Africa in Sudden Death, followed by the team from Mexico with 188 points. The winner of the Team Spirit Award, chosen by the participants, was the team from Australia. The highest individual points scores in the MercedesTrophy World Final were achieved by the following players: Jonas Madsen from Denmark was the overall winner with 72 points who won also Class A with 75 points. Class B was won by Nkosinathi Ngcobo from South Africa with 73 points and Eamonn McCann from the United Kingdom won Class C with 75 points. "The tournament is an excellent opportunity for us to welcome our customers from all over the world to Stuttgart, our brand's home," explains Lueder Fromm, Director of Global Marketing Communication Mercedes-Benz Cars. "The 24th MercedesTrophy World Final served up outstanding performances on the course, memorable experiences off the course, lots of enjoyment and a worthy winner in the team from South Africa. Many congratulations!" In addition to the sporting activities, the MercedesTrophy finalists had an opportunity to experience the Mercedes-Benz brand at first hand. The itinerary included a visit to the Mercedes-Benz Museum and to Mercedes-AMG in Affalterbach, a tour of the Mercedes-Benz plant in Sindelfingen, and test drives in current Mercedes-AMG models. Furthermore, the guests were treated to an exclusive presentation of the new S-Class S 63 AMG, which celebrated its world premiere two weeks ago at the Frankfurt International Motor Show. Those participating in the MercedesTrophy World Final were battling for the final place in this year's special competition "Drive to the Major, with Fred Walters from Canada coming out on top. Everyone taking part in the MercedesTrophy worldwide has the chance of participating in another unique golfing event. Contestants can win a place in the qualification tournament for the "Monday After Event" in the "Straightest Drive" competition. As official patron of the world's oldest golf tournament, Mercedes-Benz gives players the chance to tee off on the same course on which the professional golfers were battling for victory on the previous day. Furthermore, the winners get to experience the Open Championship as Mercedes-Benz's VIP guests. The special competition "Nearest to the Pin" was sponsored by Laureus Academy members and Brand Ambassadors Franz Beckenbauer and Boris Becker. In addition to receiving the amounts donated during the MercedesTrophy World Final, the Laureus Sport for Good Foundation also benefited from all the donations at the MercedesTrophy qualification tournaments played around the world. Mercedes-Benz is a founder member of the foundation, which tackles social challenges world-wide using funds raised through sport. It currently sponsors over 140 social projects worldwide, primarily aimed at helping children and young people affected by poverty, homelessness, war, violence, drug misuse, discrimination and AIDS. BMW Masters: Showdown of the stars in Shanghai. BMW International Open: No let-up from leader Dredge. Die BMW International Open 2010 eginnen mit einem einzigartigen Erlebnis für die besten jugendlichen Amateure. Weltmeister und Olympiasieger unter sich. The BMW Golfsport Bag and Golfsport Shoe Bag. BMW Championship 2009: Donald opens “Best-in-class” tournament. Ladies German Open "presented by Audi"